Stephen JORDAN (1589 – 1670) was Alex’s 11th Great Grandfather, one of 4,096 in this generation of the Shaw line. 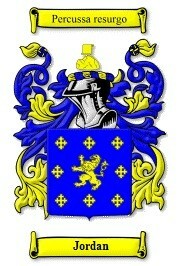 Stephen Jordan was born around 1589 in Denham, Suffolk, England. He married Susannah PEACOCK or PEABODY around 1614 in Denham, Suffolk, England. He sailed with his family sailed for America on the ship “Mary and John“. Stephen took the oath of supremacy and allegiance on 24 Mar 1633/34, a necessary act in order to sail. He settled in Ipswich. After 1655 he married Susanna Wolterton, the widow of Nathaniel Merrill and moved to Newbury. Stephen died 8 Feb 1669/70 in Newbury. Passenger lists only had the names of adult males who took the requried oaths before sailing, but presumably Stephen was accompanied by his wife (there is not record of her in New England, nor is there record of her death in England) and daughters. Susannah Peabody was born in 1585 in Wherstead, Suffolk, England. Susannah Wolterton was born in 1610 Wherstead, Suffolk, England. Her parents may have been Stephen Wolterton and Susannah [__?__]. She first married 16 Mar 1635 in Wherstead, Suffolk, England to Nathaniel Merrill (b. 4 May 1601 in Wherstead, Suffolk, England – d. 16 Mar 1655 in Newbury, Essex, Mass.). Mary Lovering Holman believed that she was a sister of Gregory Wolteron, but in 1993 Sanborn, Anderson and Smith demonstrated that this could not be, and her maiden surname might remain unknown. Susannah died on 25 Jan 1672/73 in Newbury. Stephen’s first residence was in Ipswich, Mass. 1636 – Granted a house lot, three rods of ground lying in Stony Street leading to the river, first granted to [our ancestor] Humphrey BRADSTREET, next door to one owned by his son-in-law Thomas CROSS. 26 Mar 1650 – One of four men excused from militia training, probably because he was over 60 years old. 20 Dec 1653 -“Steven Jordan of Ipswich” sold to “Jno. Pickard of Rowley … twenty-five acres of land, which is in length one hundred rod & in breadth forty rod” . 1653 – Stephen, [our ancestor] Robert CROSS, and William Whites agreed to tend 30 sheep owned by Simon Bradstreet, with provisions for the division of the wool and meat at the end of the season. They were turned over to Cross’ two boys, Robert and Stephen. 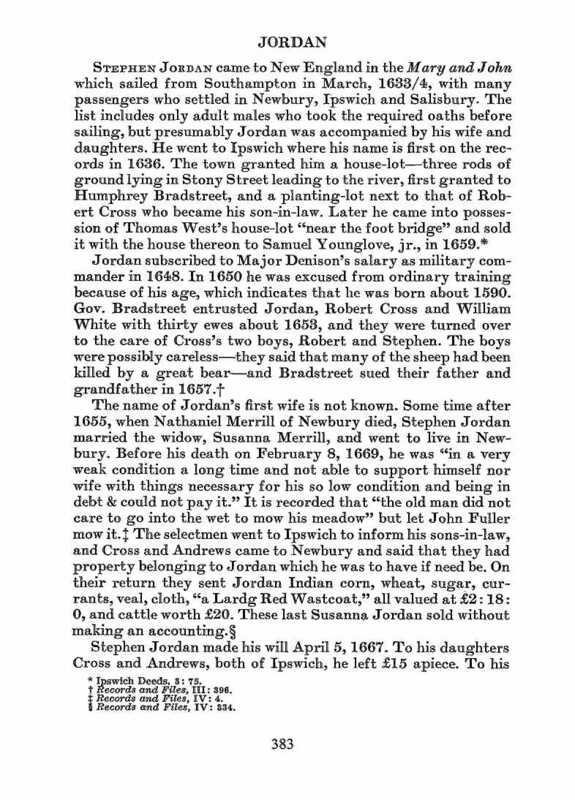 The boys were possibly careless – they said that many of the sheep were killed by a great bear – and Bradstreet sued their father and grandfather in 1657.
c. 1660 – Removed to Newbury (when he married his second wife). In his will, dated 5 April 1667 “Stiven Jorden of Newbery” bequeathed to “my daughter Croose of Ipswege fifteen pounds which is in her husband’s hand already”; to “my daughter Androse of Ipswich fifteen pounds which is in her husband’s hand already”; “for my house and land in Newbery I give it to my wife during her natural life and after her decease I give it to Stiven Croose the son of Robort Crose of Ipsweg my son-in-law”; to “my wife” two cows and half the household goods; to “my sons Robart Crose and John Andros” the other half of the household goods equally divided between them; “Stiven Crose shall give to his kinswoman and my grandchild Elezabeth Androse out of the land given unto him the sum of five pounds”. 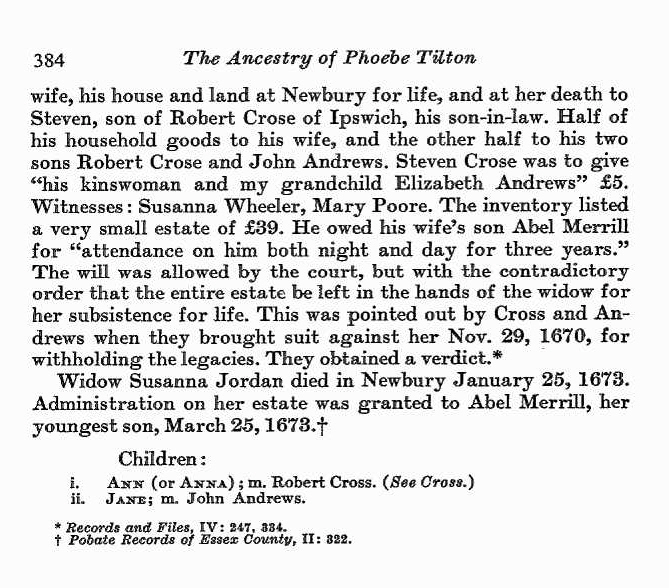 28 Mar 1671 – “Robert Crose Senior and John Andrews Senior” successfully sued “Susana Jordan, widow of Stephen Jordan, for withholding one-half of the goods the late Stephen Jordan bequeathed to them in his will, also some other legacies from said Jordan, under color of an order of Ipswich court and surreptitiously obtained for want of true information is plaintiffs’ absence, dated Nov. 29, 1670”. EDUCATION: Signed his deeds. Signed a deposition of 11 August 1667 and his will by mark. His inventory included “one great Bible” valued at 10s. Jane’s husband Lieut. John Andrews was born Abt. 1621 in England. John died 17 April 1708 in Chebacco Parish, Ipswich, Essex, Massachusetts. He married Jane Jordan Bef. 1646 in Ipswich, Essex County Massachusetts4, daughter of Stephen Jordan. She was born Abt. 16224, and died Aft. 13 March 1705/06.